What are the Best Remote Controls for Kodi? Kodi is more than awesome as a home media center and playing your favorite movies or TV shows. It is also very easy to customize from Addons to different remote controls. Kodi can be controlled in many ways from using a standard computer mouse to dedicated remote control. After using a standard remote getting a small mini keyboard remote is a nice step up for controls. This is especially true when using the onscreen keyboard built into Kodi. While a standard remote does work it is much simpler and easier to have a small keyboard remote to type with. The good news is dedicated Kodi remotes are cheap and come in many shapes and sizes. From using your android TV box to a HTPC there is a Kodi remote for everyone. There are many low cost Kodi controllers that are multi functional and have a small built-in keyboard. So What are the Best Kodi Remote Controls? As with anything it is a matter of preference which remote is best to use. With that in mind here is our favorite units along with reviews. The iPazzPort is a popular remote for a variety of platforms including Kodi. The layout and style have been available for a few years and steadily improved. It has a touch-pad to control the mouse pointer and a small keyboard for typing. A small USB dongle plugs in and automatically syncs to the keyboard. The hardware compatibility of the iPazzPort is wide ranging from an android TV box to a PC. Jelly Comb makes this small touchpad remote control keyboard combo. The touchpad is in the center and keys on the outside. It is a good low cost unit that is compatible with Android or Windows. It communicates to most any device with built-in Bluetooth from an Android TV box to a PC setup. 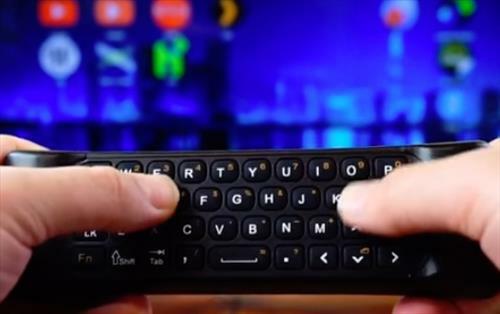 The Rii Mini is another popular remote control keyboard that works well with Kodi. It is small and fits into the palm of your hand with a small keyboard and touch pad to control the mouse cursor. Like the iPazzPort it is also compatible with many hardware platforms including PC, Mac, Xbox 360, Xbox One, PS3, PS4, and Android TV Boxes. The Rii Mini has been available for a while and is a popular low cost option to control Kodi remotely. Air mouse pointers move a pointer on a screen automatically without a touch pad. Where ever the remote is pointed to on a screen the cursor is there. Some don’t like Air Mouse remotes while others love them. As with any controller Its a matter of preference. There are several nice air mouse controllers with the MX3 a good unit for most any device. It is compatible with Android TV boxes, Windows 10 PC, Projectors and more. The MX3 is a nice remote that works very well with Kodi. This small keyboard folds up when not being used making it easy to store away or be taken on a trip. It works with Androids, Windows, and iOS devices making it compatible with most any device form a smartphone to a PC. The iClever Tri-folding Keyboard is not an everyday remote control but would be ideal in many scenarios such as when traveling. There are many good remote controls for Kodi with those above just a few to choose from. What type of hardware that is used to run Kodi will need to be taken into consideration and need to be compatible with the controller. Keep in mind that most computer mouse and keyboards will also work with Android TV boxes and can be a good option for some. Having a good controller can go a long way to make a Kodi media center a much better experience. Try the Logitech K400 – quite inexpensive, AMAZING range (whole house – and I live in a 3 storey), smaller than the ‘standard’ Logitech, and I have likely 12 friends with them as Kodi remotes – not a single failure (as opposed to the full size Logitechs). They’re quite often used as sale items, so watch for pricing. lol, so lame i ditched everyhing microsoft 9 yrs ago for linux. I wish Logitech didn’t retire the diNovo Mini… but then they have a long tradition of retiring highly successful quality products… like the Z-5450 wireless 5.1ch speakers and Z305 USB powers speakers. One must wonder what they were thinking. The cheapest remote is the one which comes with your TV. Just activate HDMI-CEC and you can control kodi with your TV remote. And you can use it with ALL others multimedia components (tv, ampli, etc) and you can use apart the remote, your mobile phone too, once u install the Harmony app. PS u need to activate the Bluetooth in your KODI/Openelec (that works with 8.0.3 version) and “pair/connect” your remote Harmony.